In an interview with Iya Ramotu, a shop owner, HotSwen Media gathered the following information. HotSwen Correspondent: Good morning ma, may I know you ? HotSwen Correspondent: Madam, but why is everyone buying salt today? Iya Ramotu: Me I don’t know o, but I heard someone saying Ebo, or Eba something. HotSwen Correspondent: You mean Ebola ? 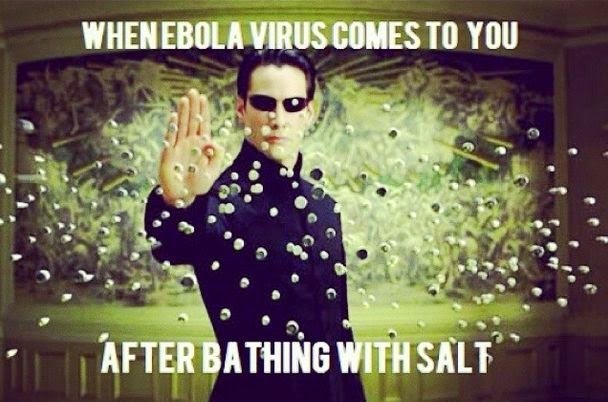 Iya Ramotu: Yes Yes Yes , Ebola, they said they want to use the salt to baff away Ebola. HotSwen Correspondent: So madam now that salt has finished in your shop what next? Iya Ramotu: It is not only in my shop o, salt has finish everywhere in Nigeria, I have called all my suppliers and they talk say salt don finish everywhere. Na Maggi we dey sell give people now. Iya Ramotu: Yes, people dey buy Maggi too, dem talk say since salt fit kill Ebola, Maggi too fit kill am , when Maggi sef finish dem go start to dey use Knorr, Onga and even Pepper baff. HotSwen Correspondent:Ohh wow , thanks for this interview Iya Ramotu. Iya Ramotu: No problem my brother, you go buy Maggi? HotSwen Correspondent: No Thank you ma. That is what Iya Ramotu had to say. Soap manufacturers have however been complaining bitterly as salt and Maggi shares have risen highly against Soap shares on the stock market..
HotSwen Media promises to keep you updated as we discover more cures to this deadly Ebola Virus. However, for now please have your bath with Maggi to be on the safe side.